HYDERABAD, India, October 15, 2012 (ENS) – More than half the world’s species of apes, monkeys and lemurs – humanity’s closest living relatives – are on the brink of extinction and in need of urgent conservation measures, wildlife experts warned today. The world’s 25 most endangered primates are named in a new report released at the UN’s Convention on Biological Diversity in Hyderabad. Representatives of some 160 governments are meeting in Hyderabad to chart a future for all of Earth’s diverse species, which are under intensifying pressure from climate change, habitat destruction, hunting, poaching and other human activities. 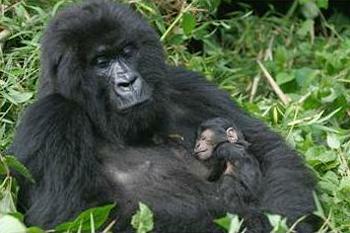 “Primates in Peril: The World’s 25 Most Endangered Primates, 2012–2014” was compiled by the Primate Specialist Group of IUCN’s Species Survival Commission and the International Primatological Society, in collaboration with Conservation International and the Bristol Conservation and Science Foundation. Issued every two years, the report reveals those species most in danger of becoming extinct. Click here to see the list issued today. Madagascar tops the list with six of the 25 most endangered species. Vietnam has five, Indonesia three, Brazil two, and China, Colombia, Côte d’Ivoire, the Democratic Republic of Congo, Ecuador, Equatorial Guinea, Ghana, Kenya, Peru, Sri Lanka, Tanzania and Venezuela each have one endangered primate within their borders. With this report, conservationists want to publicize the situations of species such as the Pygmy Tarsier, Tarsius pumilus,of southern and central Sulawesi, one of Indonesia’s islands. This primate was only known from three museum specimens until 2008, when three individuals were captured inside the Lore Lindu National Park and one more was observed in the wild. The few remaining fragmented and isolated populations of this species are threatened by human encroachment and armed conflict. Madagascar’s lemurs are threatened by habitat destruction and illegal hunting, which has accelerated since the change of power in the country in 2009. 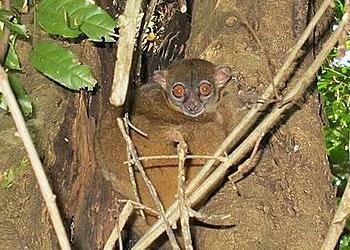 The rarest lemur, the Northern Sportive Lemur, Lepilemur septentrionalis, is now down to 19 known individuals in the wild. A red-listing workshop on lemurs, held by the IUCN SSC Primate Specialist group in July, revealed that 91 percent of the 103 species and subspecies were threatened with extinction. This is one of the highest levels of threat ever recorded for a group of vertebrates. 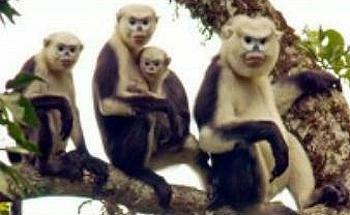 “Once again, this report shows that the world’s primates are under increasing threat from human activities. Whilst we haven’t lost any primate species yet during this century, some of them are in very dire straits,” says Dr. Christoph Schwitzer, head of research at the Bristol Conservation and Science Foundation. Fifty-four percent of the world’s 633 primate species and subspecies with known conservation status are classified as threatened with extinction on the IUCN Red List of Threatened Species. The main threats are habitat destruction, particularly from the burning and clearing of tropical forests the hunting of primates for food, and the illegal wildlife trade. “Primates are our closest living relatives and probably the best flagship species for tropical rain forests, since more than 90 percent of all known primates occur in this endangered biome,” says Dr. Russell Mittermeier, who chairs the IUCN SSC Primate Specialist Group and also serves as president of Conservation International. Despite the gloomy assessment, conservationists point to the success in helping targeted species recover. Due largely to the efforts of dedicated primate conservationists, and underpinned by considerable public and media interest in the plight of our closest relatives, the world has not lost a single primate species to extinction in the 20th century, and no primate had yet to be declared extinct in the 21st century either, although some are very close to total extirpation. This is a better record than for most other groups of larger vertebrates that have lost at least one, often more, species. Several species have been removed from the IUCN Red list, now in its seventh edition, because of improved status, among them India’s Lion-Tailed Macaque, Macaca silenus, and Madagascar’s Greater Bamboo Lemur, Prolemur simus, which appeared on the first six lists, but has now been taken off thanks to the great increase of interest generated by its appearance as a top 25 species.